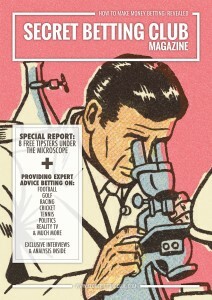 Enjoy A 2nd Free Tipster Report – 2 More Expert Reviews To Read! If you enjoyed our Free Sample Report last week, then I have good news as you can now download a SECOND Free Sample Betting Report, featuring 2 expert tipster reviews for you to read in full. With 2 highly profitable and successful racing & football tipster reviews to check out, it should provide a glimpse of just how the Smart Betting Club can help you make money betting. Because when it comes to uncovering genuinely profitable tipsters – we have you covered! As an SBC member you can enjoy reading countless similar reviews (both new on the scene and those featured in our 10 year+ back catalogue). This second Free Report is available to download now in PDF format – simply sign up for a free membership to access the report. The SECOND FREE Report – What’s Inside! Our second in-depth review focuses on this very unique football ‘loophole’ tipster taking a fresh approach to making money on the beautiful game. Different to anything seen before, we examine this service in-depth, the outstanding profits being made and just who it will appeal to! 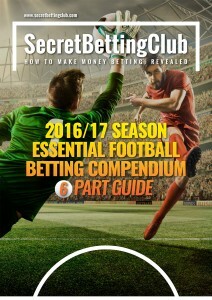 Inside this second free report, you can also read the SBC Bet Diary, which is a real-life betting blog, dedicated to one man’s ongoing ability to make money following expert tipsters. The idea behind the Bet Diary is to provide some real-life, genuine, experiences of just how the tipsters we rate and recommend can make you a realistic extra income stream. You can read 2 of the most popular Bet Diary posts entitled “Why Betting is such a good investment…Part’s 1 & 2” below to give you a taste of what is on offer! Racing & Darts: How Do Black Type’s Odds Compare? 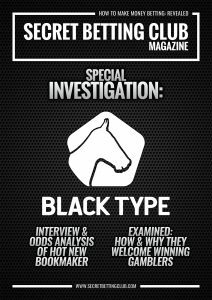 On Friday, we released for FREE our special report on the new bookmaker, Black Type, who have been causing quite the stir given their ‘winners-welcome’ policy and guarantee to lay to lose up to £500 on any given bet. Yet whilst their unique approach to bookmaking is very welcome, what many punters want to know is does their winners-welcome policy come at a cost in terms of the odds they offer customers? Therefore, to help answer this question and gauge just how their odds stand up in comparison, I commissioned some detailed odds tracking across two key sports they keenly price up – horse racing and darts. You can read about this in more detail in the Free Black Type Report, but for those of you interested in either Horse Racing or Darts (Especially given that the PDC World Championship starts on Thursday) I have summarised some of the key findings below. To examine Black Type’s odds, my team and I analysed the prices they offered during the recent Grand Slam of Darts tournament in November. To gauge this, we tracked the odds for both players across 37 Darts games from the Group Stages to the Quarter Finals, leaving us with 74 sets of odds to compare. We recorded the odds for all 74 outcomes from 7 different bookmakers: Black Type, Bet365, Bet Victor, Paddy Power, Skybet, William Hill & Coral. The odds were taken at various times of day to ensure we compiled a wide and varied cross section of data. Taking as an average, Bet365 lead the way with average odds of 2.72, with Black Type in 5thposition with an average of 2.62 – a small difference of 0.10. As useful as this study was, it is slightly flawed for two reasons – firstly the low data sample and secondly the influence of a few larger priced ‘outliers’, which skewed the results. Although most matches in the Grand Slam of Darts were competitive, there were a few games which featured a very short-priced favourite, usually Michael Van Gerwen, and a big priced outsider. The price of the outsider in these matches could be as high as 15/1 and with such a small pool of data, it only served to skewer the results. For example, on the 14h November, Max Hopp was priced as big as 10/1 with Bet365 and as low as 7/1 with Paddy Power to beat Michael Van Gerwen. Here then is the table of average odds after removing these 5 players priced at over 5/1. Without the 5 outsiders, the differences between all 7 bookies is marginal with Black Type more than holding their own. So small were the differences in fact, we had to illustrate them to 3 decimal points! Bearing in mind the limited data sample we could gather from the Grand Slam of Darts tournament, Black Type’s odds on the sport were clearly very competitive. Considering how quick some of their bookmaking rivals are to close and restrict the accounts of punters that do well on Darts, there is even more reason to consider using Black Type for betting on the sport. The likes of Bet365 and Bet Victor might on average offer marginally better odds, yet you do run the risk of being restricted if taking industry stand-out prices with them once too often. For those of you keen Darts punters – make sure you also check out their free Sign The Board Darts podcast hosted by Andy Dawson and featuring guests such as comedy legend, Bob Mortimer. To understand just how Black Type’s racing odds stand up, we also tracked and compared their overround with those on offer from 3 different bookmakers: Coral, William Hill & Ladbrokes. We chose Coral, William Hill & Ladbrokes as they are considered more ‘traditional’ bookmakers, with a very large betting presence both online and in the high street. Analysing 75 races in total, we recorded the odds at different times of day and over a variety of races to build as detailed and varied a set of data as possible. This analysis ran from the 28/10/16 to the 13/11/16, which also included each race at the Cheltenham Open meeting – helping us gauge how strong their odds were at a major race meeting as well as the standard midweek racing fare. Taken as an average, Black Type’s overround was the best overall at 115.03%. This was 0.45% better than Ladbrokes, 1.29% better than William Hill and 2.70% better than Coral. A very positive start to proceedings and an early indication that they offer good value racing odds. The Cheltenham Open Meeting ran from the 11th to the 13th November and with the high-quality racing on show, it was also useful to isolate the overrounds from this meeting for comparison purposes. It is generally accepted that at these bigger meetings, with the greater volume of money swishing around, bookmakers pay more attention to their prices and take larger sized bets. Once again Black Type offered the lowest overround, although the differences between them and their competitors was bigger than ever. The Black Type overround of 108.59% was 3.87% better than William Hill, 4.53% better than Ladbrokes and 6.63% better than Coral. From this analysis, it is safe to say they more than held their own and their policy of ‘winners welcome’ does not come at a cost of worse odds in the horse racing markets. If anything, the Black Type setup is allowing them to offer better value odds that favour the punter. Perhaps the notion of employing skilled racing traders able to build and manage a proper racing book is not as dead a concept as some bookmakers would have you believe. Read The Full Report & Enjoy More Betting Help! I have summarized some of the analysis in this email for reasons of brevity, so those of you interested in understanding more I encourage you to access the full report for free. Click here to download. With so much high quality Darts & Racing to look forward over the next few weeks, its without doubt a great time to consider a Black Type account. Especially those of you impacted unfairly by account restrictions and closures by other bookies. For those of you looking for further help with your betting over the festive period – then why not consider a Smart Betting Club membership? By signing-up today you can enjoy access to our 10+ year back catalogue of expert tipster reviews, interviews and strategies. 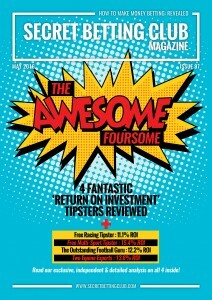 Including every single tipster review we have ever written (there are literally hundreds available!) and all of the Hall of Fame Tipsters we recommend to make you money betting. Join the Smart Betting Club and see how we can help you make money betting. Black Type Interview: Investigating the new bookmaker everyone is talking about! Originally published in the special SBC Black Type Report from November 2016, below you can read the exclusive interview with the new bookmaker, Black Type. Despite only launching in August 2016, Black Type have already established themselves as a significant player in the UK betting market becoming arguably the most talked about start up bookmaker since Betfair burst onto the scene over fifteen years ago. Like Betfair, Black Type opted against a high profile ‘marketing driven’ launch but quickly caught the attention of both the betting public and media by becoming the first on line bookmaker to offer a guaranteed ‘bet to win’ on horse racing and sport together with a promise not to close accounts. Smart Betting Club Editor, Peter Ling, caught up with Black Type’s Head of Operations Stephen Davison to get an exclusive insight into the bookie everyone is talking about. SBC: Can you tell me a little bit about Black Type why and when it was launched and who is behind it all? Stephen: In a similar fashion to a trainer looking to land a gamble, Black Type was a venture that was a long time in the planning as the management team and investors ensured they had everything in place to maximise the impact of Black Type’s launch. This included identifying the previously unheralded FSB Technology as the right company to power the Black Type sportsbook and working with them for over two years to bring Black Type to market. For Black Type, there was a clear gap in the market just yearning to be filled with an ever-growing number of punters becoming dissatisfied, for a variety of reasons, with their existing bookmakers not just for racing but all sports. All these punters needed a home or more precisely a traditional bookmaker who would make betting simple again by offering good odds, treating punters fairly and most importantly of all, letting punters get on! There was only one place where Black Type could announce their arrival into the UK market and that was on Oddschecker. Again, the two firms worked very closely, for an extended period, which culminated in Black Type coordinating going live to the betting public at the same time as they went live on Oddschecker. We were never going to be do a soft launch and wanted to be busy from the off. SBC: What sports and markets do you currently take bets on and what is going to be the betting highlight for you over Christmas? Given our strong racing heritage through Mylo Sangster, the grandson of legendary owner Robert, it should have come as no surprise to see Black Type targeting horse racing to showcase our sportsbook and philosophies. We have since utilised the market momentum generated to add greyhounds and enhance our sports offering ahead of schedule. With an experienced London based trading team, Black Type are very much UK focused and we know what appeals to the UK punter. Our message is simple yet powerful, we are committed to offering ‘industry leading margins on all horse racing, greyhounds and main markets for major sporting events’. We have confident traders happy to be stand out on events and markets where we know punters will be looking to bet. This has been evident for all the ‘live TV’ football games and recent darts and snooker tournaments, where we have been pricing main markets to very competitive margins. As Christmas approaches, UK punters rightly get excited by the PDC World Darts Championships which is now well established as one of the punting highlights of the year. Regardless of what your favourite sport is, I think every punter enjoys a bet on the darts between Christmas and New Year as an escape from the ‘turkey curry with the in laws’ and our darts traders will be hoping to give the them some added festive cheer with the value of our prices. The darts coverage on Sky is brilliant and we hope to add a unique twist to that with a series of podcasts and blogs over the Christmas period which are being produced by Talk Sport presenter Andy Dawson who also co-hosts the hugely successful football-comedy podcast Athletico Mince with Bob Mortimer. Athletico Mince’s theme is supposed to be football but inevitably the conversation spins off in all sorts of unexpected directions so given the scope that darts provides we are sure it will be hugely entertaining. Bob Mortimer and Pointless presenter Richard Osman, who is a massive darts fan, are among the guests confirmed for the first podcast which is due to be released on Wednesday 14th December prior to the start of the World Championships. The second podcast will be released between Christmas and New Year when we reach the business end of the tournament and given Andy’s extensive network he is sure to have more big names lined up. SBC: One of your main selling points is the fact you claim not to restrict winning gamblers or close their accounts. Can you talk me through how this all works and what type of punter Black Type are aiming to appeal to? Some punters would worry that a service that doesn’t restrict winners, especially on sports such as horse racing might not be a viable one. What would you say in response to this? Black Type’s business model is more like that of the traditional bookies we grew up with than any of the modern ones we’re all now far too accustomed to. Most bookies unfairly, in our opinion, stack the odds in their favour by severely limiting winning accounts instead of challenging their trading teams to perform better. Unfortunately, it is the way of the industry these days that the corporate companies would prefer to retain feed providers and analysts to keep costs down and satisfy their shareholders than invest in skilled traders. Consequently, most of these restrictions are now done by ‘risk analysts’ following automated reports who would have little or no interest in the sports they are presiding over, yet alone know how to price them up. Black Type’s CEO Craig Nicholson has a proven track record of building successful trading teams and delivering results. In his previous role, as Head of Horse Racing at Kambi, he recruited and trained a large team of traders to very tight deadlines which allowed Kambi to launch 888’s racing product in record time following the demise of Blue Square. True to form, Craig has utilised his network of contacts to be able to put together a very strong team at Black Type which has the right blend of youth and experience – he has even persuaded a few well-respected names to return to the trading room who have kept us entertained with tales of coups landed in the ‘good old days’. Yes, Black Type are committed to offering competitive prices and betting to industry leading margins on big events but we are not offering a ‘free for all buffet’. We are a business not a charity. Our trading strategy will be a lot different for a wet Monday at Plumpton than it will be for prime-time racing on a Saturday. Likewise, those punters expecting to get the same bet on some obscure football game or sport as they would for a live TV game are going to be disappointed. Being an online bookmaker our prices are subject to fluctuation as soon as they go live – we don’t operate under the same restrictions as the ‘High Street’ firms who need to limit their price changes to keep their betting shop punters happy. With more and more punters wanting to take our prices, punters need to be quick and our traders need to be agile to manage our liabilities effectively by ‘old school bookmaking’. If we take a bet from a winning punter we are confident our traders will use the ‘mark’ to position themselves in the market where they will take money on other selections and build a book. We are backing our traders to set the correct odds for the right events that will attract punters through the door and effectively betting that they’ll still make a decent profit margin at the end of the month. SBC: It is noticeable that you are bucking the trend amongst bookmakers by also not offering new account bonuses, best odds guaranteed prices or free bet offers. Is this again part of the quest to be a viable, sustainable bookmaker? I think it is quite clear now that Black Type will not ‘follow the crowd’ and do things just because the ‘big boys’ do. We have gone against the industry standard by not offering any free bets or other promotions such as BOG and first bet price enhancements to entice customers. If the past few months since we launched is anything to go by, simply offering good prices and fair limits satisfies most leisure punters. With the simple layout of our website, void of the clutter that most others now deem essential, we have made it hassle free to get a bet on once again. There are enough people out there who like to have a bet who are getting a poor service elsewhere to sign-up without needing to add extra incentives. We have always said while we wouldn’t offer incentives to join Black Type we would reward our loyal customers and what better time to start than at Christmas. We are going to be doing a Cash Back offer for the duration of the PDC Darts which is something we will also look to do for the major sporting events that start 2017 like the Australian Open tennis and the Masters snooker. There is a feast of football over the festive season so for our football punters we will be introducing Acca Insurance and a Cash Back offer for selected live games. SBC: Although you claim not to restrict winners, you do say you do not welcome those who use arbitrage, ‘queue jumping’ robotic bet placement tools or other methods to gain an unfair advantage. I also spoke to one previous Black Type customer who was restricting from placing multiple bets with you after punting on regular ‘bad each way multiple bets’ (his words). Such bets are notoriously disliked by bookmakers, as are arbers, so is it safe to say there are occasions when punters might be restricted but only if not ‘playing fair’? What’s the general policy here? As with any new bookmaker who launches, we always expected to attract the sort of punters which you so eloquently describe are ‘notoriously disliked by bookmakers’. Our trading team have ‘been there, done that and got the t-shirts’ probably before most of the new breed of punters were legally allowed to bet so know all the ‘tricks of the trade’. The past few months have been interesting to observe the punters who value a bookmaker who will finally lay them a bet and those who just can’t resist the temptation of using ‘underhand’ tactics. The majority of punters have been ‘good as gold’, which has been re-enforced by the support we have had from throughout the industry. There have been a small group who have tried to use the exchanges as a ‘tipping line’ and relentlessly arb or place ‘dubious bets’ such as when a goal has been scored in football, the throw has been announced in the darts or a player has missed in the snooker. 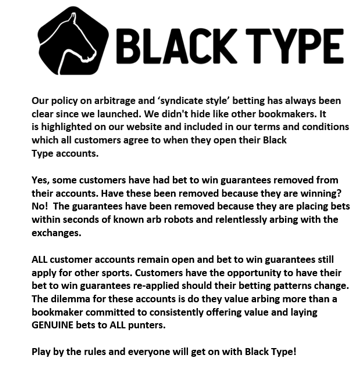 Unlike other bookmakers, Black Type will have never been afraid to address the contentious issues (‘elephant in the room’) so we released the following statement on Twitter which highlights our policy. Likewise, those punters who try to exploit the rules by betting under their fathers, brothers, wives, aunties names also risk having their concessions removed. Our traders monitor the client base in ‘real time’ so the same names backing the same selections are all very easy to for them to spot. Winners are welcome so long as they play by the rules. If they do that and beat our traders ‘hats off to them’. We should probably add that punters looking for the ‘life changing’ twenty team multiple or big price Lucky 15 are again likely to be disappointed but that’s all part of the prudent business model to ensure Black Type continues to thrive and able to offer good limits on big races / events to lots of punters. Punters who like to follow a certain tipster, like Hugh Taylor, Pricewise or those the Smart Betting Club recommends will not be penalized. They just have to accept that others will be after ‘popular prices’ too so they will need to be quick to get the best prices and also be prepared to take a lower price if they miss out. Unlike other bookmakers, their potential winnings on tipster selections will not be restricted. Our bet to win guarantees will still apply and they will still be able to have a bet to win at least £500. 1 – Without bookmakers implementing such strict restrictions policies, Black Type would not have made such an impact since launch in August and to be frank, we probably wouldn’t be having this conversation now. I would like to think in a similar fashion to Betfair, Black Type will always be recognised as the firm brave enough to seize the opportunity and do something different rather than falling in line with the rest of the industry. 2 – A lot of our traders remember the spread betting days of the late 90’s / early 2000’s where the spread firms such as Sporting Index, Cantor and IG went up with their prices at the same time and were judged on the quality of their prices. There was no hiding place then… the more you were right the more you won but there isn’t a trader anyway who hasn’t experienced the flip side of that coin. Whilst it would be great to see the industry return to those days where traders must honour prices and lay a fair bet, we must be realistic that it is sadly unlikely to happen any time soon. SBC: Black Type are the first bookmaker to officially endorse the Better Betting Campaign. Do you think this will prompt others to follow your lead? We would hope so as it is very important for the future of the industry, and horse racing in general, that punters to have confidence in the firms they are dealing with. There are other firms in the UK, like Matchbook and Star Sports, who have a similar outlook so long as the punters have a voice through groups like yourself and The Horse Racing Betting Forum there is reason to be optimistic. SBC: Turning to horse racing, many bookmakers these days simply base their prices on what is happening on Betfair. How do you form a book on a race and what time do you start taking bets? The exchanges are part and parcel of the modern betting industry. There is no denying how influential they are in horse racing and it is understandable why so many bookmakers devotedly follow them. However, it can be dangerous to over rely on the exchanges as, because of their very nature, they are open to manipulation so you need to have traders who have a good understanding of what the true price of a horse is likely to be at race time. Just because a price is available on the exchanges for pennies overnight or first thing in the morning doesn’t mean it is going to be the true price when the real money enters the market whether that be on the back or lay side. You see the chaos caused in the market when Oddschecker or the exchanges go down. Bookmakers are suddenly very reluctant to go up with prices and trade can be very slow. Our traders all have their own methods of pricing up races and will trade in slightly different ways to get the positions they want but without exception are all competent enough to price a race up from scratch. Other than the high profile televised meetings, overnight markets are generally bet to very uncompetitive margins which is unfair on the punters playing. Bookies PR reps are quick to quote ‘horror stories’ of Barney Curley style coups but these happen rarely where horses, especially favourites, being offered at poor odds are a daily occurrence. This is one of the main reasons why we opted to make our prices available at 8.30 am every morning because it offers consistency to our clients. They know that once our races are live, they will be offered value prices and can get a good-sized bet on to win at least £500. Even during the winter months, punters still have plenty of time to get their bets on before racing starts. SBC: Looking at the odds you offer on horse racing and darts for example, I have noticed that whilst they are often competitive, it’s rare you will be the only bookmaker offering the best price in a market. Is this part of a conscious decision to only offer realistic odds that you feel are sustainable? If so, it would make sense as many of the bookmakers offering best prices, also quickly restrict winning gamblers. There is no point offering attractive prices if you move them for ‘fresh air’ and don’t lay a bet. We aim to bet all races to competitive margins and take liabilities our traders are comfortable with. This is a long game it is so important to trade sensibly. When traders start being reckless and chasing money, they will learn some harsh lessons as no trader is bigger or better than the market. Likewise, it would not be wise to get into a position where a whole days trading is heavily dependent on the result of one race or match. This is also one of the reasons why we opted against offering Best Odds Guaranteed in preference to having consistently good prices, because we wanted our traders to know their exact positions when trading which isn’t possible with BOG. While marketing departments are quick to sing the praises of BOG, I don’t think there is a racing desk at any bookies that hasn’t experienced a dramatic decline in their racing profits as a result, and it is little wonder that they are quick to remove the concession from punters. SBC: Sticking with horse racing, you also sometimes offer different ‘show prices’ in the 15 minutes before a horse race starts – what is the thinking here? Show prices are outdated and are an area of horse racing that we feel needs to change. Once the opening show comes through from the racetrack, approximately 15 minutes before the start of a race, every bookmaker reverts to offering the same prices which doesn’t make sense especially when there is such a high demand for differentiation in the industry. We don’t want to be governed by a few small trackside bookmakers at minor meetings where the online markets move far quicker than they do, nor those bookies who are unable to offer standout prices at the bigger meetings. Therefore, we introduced the facility to offer our own unique prices where we can offer better value and bet to lower margins than the industry standard. We don’t offer them for every race but our traders appreciate having the flexibility to be able to get the positions they want rather than ‘gambling’ on how the bookies on course trade or how fast the feed from the track updates. SBC: Greyhounds feature prominently on the Black Type website despite it being classed as a sport in decline. Do you think there is still hope for the sport? Yes, most definitely. We are big supporters of the greyhounds and have observed a resurgence in recent years, due to the ease of access provided by RPGTV and Sky Sports. Whilst attendances at the track may never return to their previous heights, we feel that as long as greyhound racing remains on TV, the sport has a positive future to look forward to. There is a distinct difference in the quality of the betting shop ‘BAGS fodder’ and the RPGTV/Sky meetings, so our service reflects that. We are focused on quality rather than quantity. We will have competitive early prices available for all Sky Sports meetings and Romford on a Friday night which is the premier RPGTV meeting. Additionally, we will also price up the RPGTV Flying Four every evening. Greyhounds are one of the sports we are looking to focus on in 2017 and we have some exciting plans in the pipeline which we hope to reveal early in the New Year. SBC: Black Type selected FSB Technology to power your Sportsbook. What attracted you to FSB Technology and how is the partnership going? All our team have experience of working for or with sportsbook / feed providers so we were conscious of just becoming another name on a long list with one of the bigger firms where it can be difficult to get requests prioritised. We wanted to go into partnership with a firm who saw the potential of Black Type and were willing to work with us to make it a ‘flagship brand’. FSB were relatively new to the market but we knew if they had secured support from influential industry figures like Mark Blandford, who is widely regarded as one of the founders of the modern on line gaming industry having started Sporting Bet, that they must be doing something right and would be worth talking too. From the first time we met it was evident we had very similar views on the industry with both firms being prepared to take a different approach and not ‘follow the crowd’. The partnership is going really well, and it helps that they have all the capability in-house and the heritage from the UK industry, which means they understand the requirements of offering horse racing and UK sport properly. They have very modern technology too, which puts some of the legacy providers to shame. The combination of good technology alongside their technical expertise is a winning combination. The two teams are London based so are working closely together and are bouncing off each other. FSB providing a hybrid managed service has reduced the burden of starting a new bookmaker and allowed us to concentrate on the other parts of the mix that we do well. SBC: You have recently added a casino to your product range. Some customers might worry that encouraging punters to use this might be your ultimate goal as we have seen with the likes of Betfair. Why did you add the casino and what has been the reception to its introduction? Our sportsbook will always be Black Type’s priority. Like with the introduction of greyhounds and enhancement of our sports service, the casino was down to public demand. To be honest, the team don’t come from casino backgrounds, so even when we switched it on we didn’t know what to expect. Even though it is still early days, the numbers have been encouraging. Punters seem to like the fact that we have kept the casino discreet and are not overly promoting it. We are also not enforcing any turnover requirements, etc. so if punters fancy a quick game of Roulette or Black Jack, at half time in the football for example, it is quick and easy for them to get involved. Like with all our products, the casino is there if punters want to play but there is no obligation to do so. SBC: How about mobile and tablet betting – what do you offer customers on this front? Our website is fully responsive to all devices and will adjust per the device you are using. We have already had discussions with FSB regarding developing an app and that’s on the agenda for 2017. SBC: Your site is very ‘clean’ and doesn’t have additional content, such as race previews, live streaming and stats databases, that most other bookmakers have. Was that intentional? Yes, one of the advantages of not having all the ‘clutter’ is the we can ensure the site is simple to use and quick and easy to navigate. We feel there are so many good resources available for UK punters these days, such as the Racing Post and Sporting Life, that it is easy for them to find the information they want elsewhere. Once they have researched their bets we like to think they will still bet with Black Type because of the odds we offer and the guarantee of being able to get on. SBC: What other plans do you have for the future? We currently trade on FSB’s licence so one of the things we are already considering is moving onto our own licence. This is quite a lengthy process and it is not imminent but when we do it will give us far more flexibility and allow us to accept customers from outside the UK. We already know there is a high demand for Black Type from horse racing punters in Ireland. SBC: Thanks for the refreshingly open and honest interview Stephen. To conclude what are you and the rest of the Black Type team looking forward to for 2017? The gambling industry is always exciting and there is rarely a dull moment. There will be highlights throughout the year from the Australian Open Tennis in January all the way through to the World Darts Championships in December. Obviously, from a racing perspective Cheltenham will be a huge week for us and the summer flat festivals are always a great showcase. Business wise we are all looking forward to seeing the Black Type name develop and building on the positive start we have made. This interview should help clarify our principles and re-assure punters that we intend to be around for a long time to come and hopefully Black Type will become their bookmaker of choice! Thanks for your time and the support you are giving UK punters through your Betting Better Campaign. I would like to wish yourself and all your members a Happy Christmas and a prosperous New Year. As a Smart Betting Club member you can now gain access to over 10 years worth of independent tipster reviews, tipster league tables, systems and strategies…All designed to help YOU make money betting. 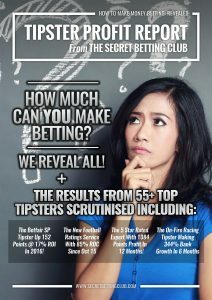 This is all part of the huge number of Betting Magazines, Tipster Profit Reports & Special Reports the SBC team has published since June 2006! To provide just a taster of what is on offer, below you can find a rundown of our latest publications from the last 6 months alone. All of which are available to you the instant you sign-up for a Smart Betting Club membership! There is a huge amount for you to sink your teeth into, whatever sports or betting markets you are interested in – we can help you beat the bookmaker! HOW MUCH CAN YOU MAKE BETTING? • The Betfair SP Tipster up 152 points profit at 17% ROI already in 2016! *Also a new Hall of Fame rated tipster! 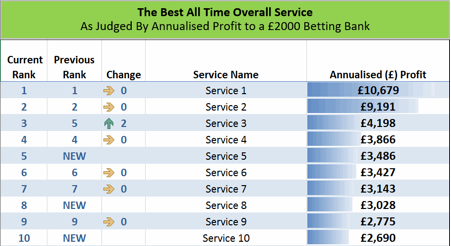 • The 5 star rated expert that’s made 1084 points profit in 12 months and currently tops our rankings! 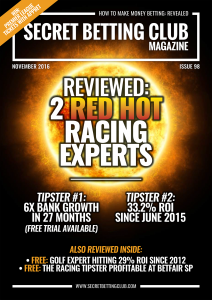 • The on-fire racing tipster that’s posted 344% bank growth in the past 6 months. 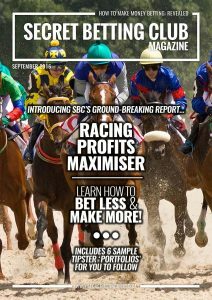 • How to easily identify the most profitable racing tips using the simple Racing Profits Maximiser Strategy. • PLUS view 6 ready to use Racing Profits Maximiser ‘Tipster Portfolios‘ for you to get started with. How To Get The Best Odds! 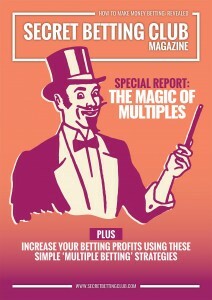 • The theory behind successful multiple betting. • How betting in multiples can help keep you under the bookies radar. • The best multiple betting strategies to follow (how and why they work). • Real-life evidence of when multiple betting works! • The Free Racing Tipster up 11.1% ROI & 140 points profit since 2013. Extremely easy to follow! • The Football Guru with 12.2% ROI from over 2000 bets in the last 2 seasons. Profitable in all 3 main markets: 1X2, Asian Handicap & Multiple bets. • The Racing Tipster duo with an excellent track record: 13.8% ROI from 2306 bets and over 200% bank growth since 2014. • The Free Golf, Racing & Football Tipster in profit to the tune of 15.4% ROI. Alongside instant access to all of the reports listed above, as a Gold or Platinum Smart Betting Club subscriber, you can also enjoy our 10+ year back catalogue of expert tipster reviews, interviews and strategies. Last month I introduced a brand new FREE feature onto the Smart Betting Club website – a real life betting blog dedicated to one man’s ongoing ability to make money following expert tipsters. Called the ‘Bet Diary’, it’s penned by profitable punter, and SBC writer, Rowan Day who, each week, discusses his ongoing betting journey including the tipsters he follows, and his performance, using their advice (win or lose – he is always refreshingly honest!). After all, last tax year, Rowan made a 64.4% Return on Capital from his betting so he knows his stuff! I would also recommend reading his introductory post. The ‘Bet Diary Pro’ was very well received, and, building on this success, we launched the FREE Bet Diary in October 2016. This FREE Bet Diary illustrates some of the real-life challenges and rewards that following the right betting tipsters can bring. If the FREE Bet Diary whets your appetite, then you can gain access to Rowan’s professional betting blog (Bet Diary Pro) as a Smart Betting Club member. First introduced in early 2015, the Bet Diary Pro provides even more from Rowan on the practical realities of following tipsters to make money betting. Through the Bet Diary Pro, you can discover the full names and identities of each of the tipsters he follows PLUS exclusive analysis and insight which is made available only to Smart Betting Club members. Access to the Bet Diary Pro is available to all with either a Silver, Gold or Platinum Smart Betting Club membership. Subscribe now and gain full access. The Smart Betting Club aren’t the only service celebrating a 10 year anniversary in 2016 as renowned non-league football tipster, Skeeve, also turns 10 on December 12th and to celebrate this fact, he is offering ALL Smart Betting Club members free access to his service during the whole of December. Skeeve has a tremendous long-term record (He has made +667 points profit at 12.2% ROI in these 10 years), which is down to the phenomenal amount of study and research he puts into understanding the non-league football scene. So far in 2016, he is also up +19.23 points profit (16.5% ROI, 32% ROC) so it’s a great opportunity to sample his expertise for yourself. Skeeve’s offer is part of the significant tipster priority discounts, deals and free trials we negotiate on behalf of Smart Betting Club members (although we only feature such deals from those tipsters we have reviewed and subsequently found favourable). This offer is available to all Gold or Platinum Smart Betting Club members and will be on offer throughout the whole of December. Make sure you sign-up ASAP to get this Saturday’s advice!